An interactive food and farming event is set to give 7000 children a definitive understanding of how farmers produce their food, and the journey from field to plate. 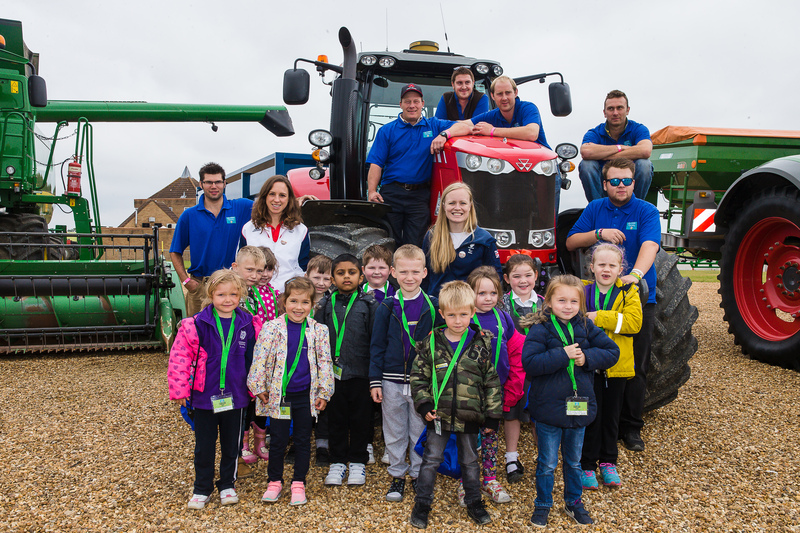 The Kids Country Food and Farming Day, organised by the East of England Agricultural Society and sponsored by the Central England Co-operative, is to be held at the East of England Showground in Peterborough on 30 June. Organisers say the event has a very important role to play especially after the recent publication of British Nutrition Foundation (BNF) research that showed a worrying number of children thought pasta came from animals, dairy cows produced eggs, and bacon originated from cows, chickens, or sheep. Sandra Lauridsen, Kids Country Education Manager, said: “The Kids Country Food and Farming Day is important because it educates children, and their families, so they know how farmers produce their food and the journey from field to plate. “The BNF research just goes to show the amount of work that needs to be done to ensure children not only have a full and rounded view of what is in their food, but to know where it comes from and how it is produced. “Farming plays a vital role in everyone’s lives and needs to be supported and maintained. It’s crucial everyone understands how it works, its high standards, and the pride farmers have in the food they produce. We want children to feel empowered and able to make informed choices about what they eat, in terms of healthy eating and the impact on British farming. “With the support of the Central England Co-operative, the Food and Farming Day gives is the chance to educate thousands of children and encourage them to talk to their families about food and the choices they make, and play a major part in growing public support for our industry. This year’s event is set to be attended by schools from Cambridgeshire, Lincolnshire, Essex, Hertfordshire, Bedfordshire, Leicestershire, Warwickshire, and London, and will feature 309 exhibitors from 85 companies offering various activities across 14 learning zones. It is backed by Baroness Byford, a member of the House of Lords who served as Opposition Parliamentary Spokesman for Food, Farming and Rural Affairs from 1997 to 2007. She said: “The event gives children the opportunity to see how their food is produced – for many it will be the first opportunity to hear about the process food goes through and of the variety of skills involved along the way. Speaking about the support from Central England Co-operative, Karen Ball, Member and Community Relations Officer, said: “The Co-operative has a long tradition of giving back to the community, and we welcome the opportunity to make a real difference to the lives and education of local children. “Both Heather and Laura are incredible athletes who both understand the importance of choosing to eat food produced to the highest possible standards and by British farmers, as well as how vital it is to have a nutritious, balanced diet,” added Sandra. For further information about the event visit www.eastofengland.org.uk/kids-country. To download images of Sandra Lauridsen, athletes Heather Fell and Laura Sugar, and shots from Food and Farming Day 2016, click here. Kids Country is the education arm of the East of England Agricultural Society. Now in its fifth year, it runs a busy and successful programme to help teach the region’s school children, including those with disabilities, about food, farming and the countryside. As well as the Food and Farming Day, other Kids Country activities include involvement in Breakfast Week, Cub & Beavers Day, Lambing Sunday, and Open Farm Sunday, and events such as Grow Your Own Potatoes and Beetroot, and Happy Chicks Day. The Agricultural Society also administers the Marshal Papworth Fund, which provides agricultural and horticultural scholarships to help students from developing countries develop practical skills and valuable knowledge to share within their local communities in order to meet future food needs for generations to come. Central England Co-operative is one of the largest independent retail co-operative societies in the UK. It is a modern, forward-looking organisation employing over 8,000 staff, with projected gross sales of £958million for 2016–17. The Society recently celebrated being named Leading Co-operative of the Year 2016 by Co-operatives UK. The Society’s principal areas of activity are food, funeral services, and property. Central England Co-operative has more than 430 trading outlets across 16 counties including; West Midlands, Warwickshire, Worcestershire, Staffordshire, Derbyshire, Leicestershire, Rutland, Nottinghamshire, Northamptonshire, Lincolnshire, West Yorkshire, South Yorkshire, Suffolk, Norfolk, Bedfordshire, and Cambridgeshire. The Society has an ambitious food store development programme for 17. For more information visit www.centralengland.coop, follow Central England Co-operative on Twitter: @mycoopfood, and on Facebook: facebook.com/centralenglandcooperative.